That guy on the right is Lee “Infiltration” Seon Woo. You might remember him from last year’s Evo Street Fighter V tournament,which he won. A veteran of the scene who’s been competing since 2010 with Super Street Fighter IV, he’s now housing energy drinks in-between matches to help pay the bills. The details of his collaboration with the company’s whose canned liquids carry caffeine levels capable of seriously injuring certain small children haven’t been revealed, but he seems to be dutifully carrying them out despite the high-pressure atmosphere at this year’s Evo. Street Fighter’s own Peyton Manning when it comes to thirst, Infiltration is a master of the tongue-in-cheek irony that walks the line between deadly serious and seriously absurd. Any potential side-effects aside, Infiltration nevertheless didn’t miss a chance to after pushing the product to troll his rival. fLoE has a penchant for demolishing scrubs and playing under his ability against tough opponents. 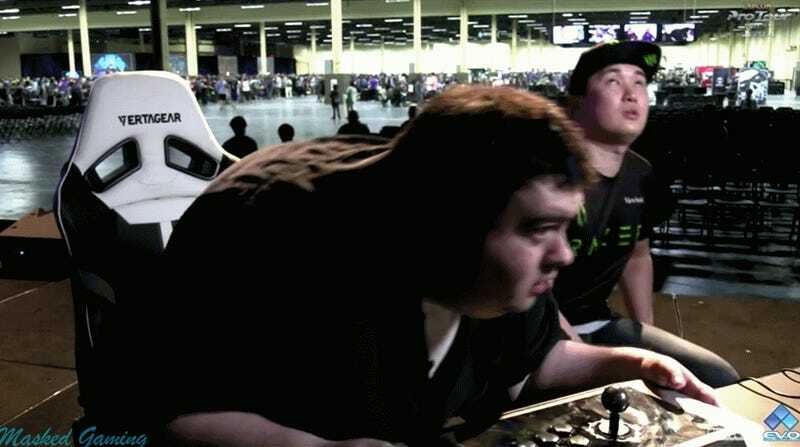 He also seems to always end up meeting Infiltration early in pools play at tournaments only to get bodied. Hence the curse. That’s what happened this time as well, with Infiltration taking the set with ease. Sent down to the lower bracket, fLoE was sent packing a few matches later after losing to Ludovic Mbock. Infiltration, meanwhile, found his own way down into the lower bracket after losing to last year’s Capcom Cup winner, Du “NuckleDu” Dang. He’s still in it, but has a long road ahead as he fights to make it through against an increasing number of other high-level fallen players. Still “alive” in the bracket at least. Who knows what the state of his body will be by the end of the tournament.